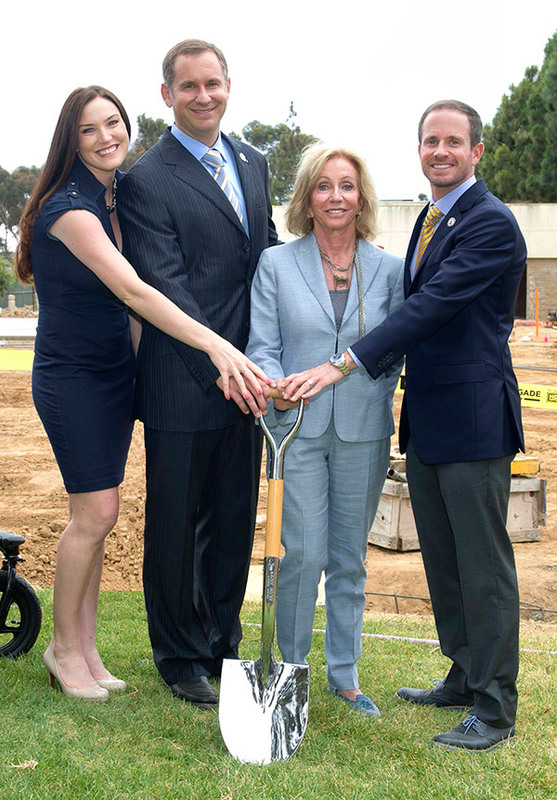 The University of California, San Diego was joined by members of the Spanos family at the ceremonial groundbreaking for the new Alex G. Spanos Athletic Performance Center earlier this week. The new center is made possible by a lead gift of $500,000 from Dean Spanos, chairman of the board of the San Diego Chargers, and his family to revamp and expand the existing Alex G. Spanos Training Facility, located on the northwest side of campus. The Spanos family’s support of UC San Diego Athletics dates back as early as 1976. For many years, the San Diego Chargers had an agreement to use UC San Diego as their annual training camp. In 1988, Chargers owner Alex Spanos offered to construct and donate a locker room and training facility—an in-kind donation that was valued at $1.1 million and recognized with the naming of the Alex G. Spanos Training Facility. The new center is named in honor of the Spanos family patriarch. With $800 in borrowed money and a tireless work ethic, Alex Spanos built one of the leading real estate and development companies in the nation, A.G. Spanos Companies. In 1984, he purchased the San Diego Chargers and has since kept management of the organization in the family. Attendees at the groundbreaking included Dean Spanos’ wife Susie and their two sons, John and A.G., as well as A.G.’s wife Kamri and their infant son, Dean. Edwards thanked the Spanos family during the ceremony and presented Susie, A.G. and John with awards—engraved kettlebells—in recognition of the family’s support to make the new center possible. Situated above Triton Track and Field Stadium, the new Alex G. Spanos Athletic Performance Center will feature a strength and conditioning area, outdoor performance plaza, hydrotherapy room and more for student-athletes. Currently, strength-training equipment at RIMAC is shared by the entire student body, with space at times reserved for student-athletes. The new center will benefit the entire UC San Diego community with improved access to weight-training equipment. Slated for completion in fall 2015, the Alex G. Spanos Athletic Performance Center will also serve as an important tool in recruiting outstanding future student-athletes. Collectively, the Spanoses have given more to UC San Diego’s intercollegiate athletics program than any other family or single donor, with gifts totaling more than $1.6 million. Click here to see a video from the event. Alumni, parents and friends can also make an online gift toward the Alex G. Spanos Athletic Performance Center, here. To learn more about the center and naming opportunities still available, please visit ucsd.edu/go/spanos or contact Diana Barnard at (858) 534-3540 or email here.